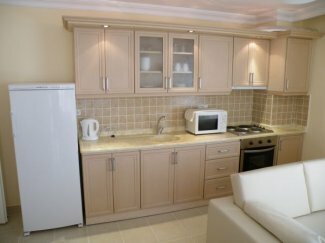 A beautiful purpose built apartment just 100 metre from the beach. The complex was built in 2008 and benefits from its own pool. 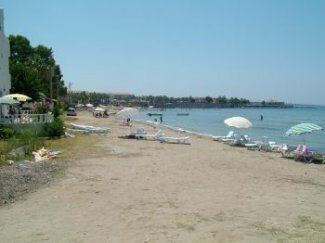 It is situated in Mavisehir, just a short distance from the nightlife of Altinkum; local buses run from the end of the road every few minutes. There are a number of small shops and bars within walking distance. The area contains mainly traditional Turkish houses and is therefore relatively quiet. 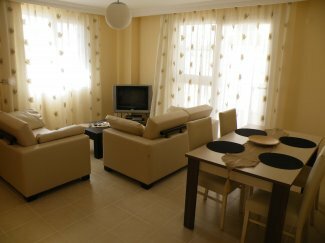 The apartment is fully air-conditioned and is fitted with security grills and fly screens. Just leave the windows open and benefit from the cooling on-shore breezes in the knowledge that you are secure. There is room to sunbathe in the landscaped gardens, with shade for those of fairer complexion. For your more energetic days, you will find the Aqua Park less than 1 km away. For those who wish to shop, the famous Mavisehir night market is about the same distance away. Although the apartment is on the ground floor it is accessed via a flight of stairs from a security door at the lower rear level. This door can be opened using the phone security system in the property. This is light and airy, having dual aspect windows; a door leads to the wrap around balcony. For your comfort, there are two sun-loungers with cushions, a two-seater patio table and 2 chairs on the balcony. In the lounge, there is a dining table which seats four people; two two-seater sofas, satellite TV and a DVD player. You can tune into music channels on the TV. The kitchen is fully-equipped, having a large fridge with freezer compartment; electric hob and oven; microwave; toaster; kettle; extractor cooker hood and plenty of cupboard space. There are sufficient plates, glasses, cutlery, pots and pans etc for 4 people. The bathroom has a walk-in shower cubicle, vanity mirror with light, tooth-brush/mug holder and shelf; there is a washing machine, clothes airer, ironing board with iron and mop/bucket. This is a large bedroom with a double bed, complete with triple wardrobe, (with wooden coat hangers), with drawers and shelves and a full length mirror. There is a hairdryer, with diffuser; 2 bedside cabinets and 2 bedside lights, for a romantic soft lighting touch. There is also a separate free standing chest of drawers, so you will not run out of space. There is also a wicker chair. Each bedroom comes with 2 bath sheets and 2 hand towels; summer and winter bedding. The second double bedroom also contains a double bed, with summer and winter bedding provided. This bedroom is a little smaller than the master bedroom but has the benefit of having direct access onto the wrap-around balcony. There is a bedside cabinet, with bedside lamp; a double wardrobe, (with wooden coat hangers), drawers and shelves and a full-length mirror. The pool is T-shaped and situated between the two apartment blocks. It has a child-friendly area for the younger ones to paddle in. The pool has easy access by steps going down, which are the full width of the swimming pool. It is regularly maintained and kept clean by the management company. We also own a 1 bed roomed property in the same building.